Grotzec Condensed has been expanded to include three new weights: Extralight, Ultralight and Thin, along with matching italics for the full family. Grotzec Condensed was originally designed in 1998 for Surf Portugal magazine while Mário Feliciano was the magazine’s art director. The original 5 weights of the typeface were released by Feliciano Type Foundry in 2004. Grotzec Condensed was inpired by early European grotesque types found in late 19th century posters and advertising pieces. While it does not stray terribly far from the source models, Grotzec Condensed features some formal aspects that help to differentiate it from typical grotesques. The use of rounded curves on the outside of the letters and ‘square’ curves on the inside of the shapes, like you can see on the letter R and in lowercase letters such as b, d, p and q, gives the typeface a subtle humanist twist. The rounded top curve joins the vertical differently from the bottom curve join, creating a smooth calligraphic feeling not usually present in grotesque fonts. 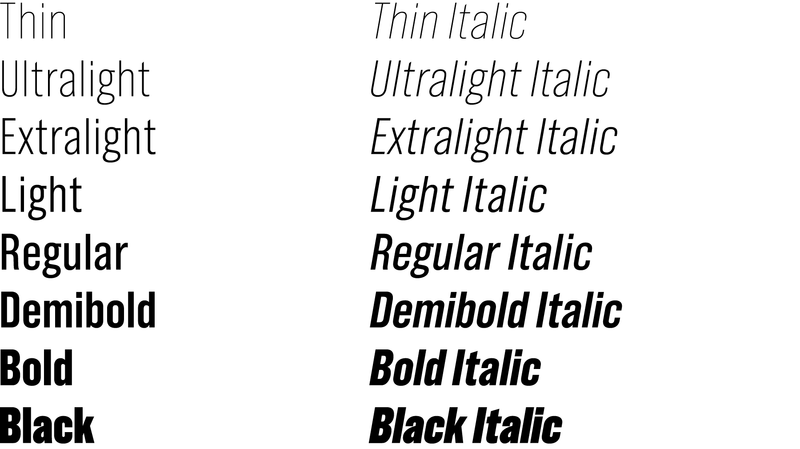 The new italics are slanted and corrected versions of the romans, except the letter f, which descends below the baseline referencing true italics. Grotzec Condensed contains an extended character set supporting most languages using the Latin script. It also includes tabular figures, fractions, small figures, arrows and other useful symbols.